The Igarka Geocryology Laboratory is a scientific affiliation of the Melnikov PermafrostPermafrost is frozen ground that remains at or below zero degrees Celsius (32 degrees Fahrenheit) for two or more years. It forms in regions where the mean annual temperature is... More Institute in Yakutsk (Siberian Branch of the Russian Academy of Sciences). 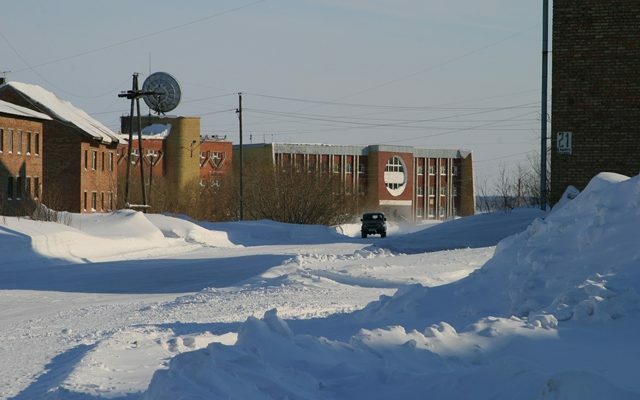 The Igarka Geocryology Laboratory is situated in Igarka (67°27’11’’ N, 86°32’07’’ E), on the right bank of the largest Russian river Yenisei, 120 km north of the Arctic CircleA line of latitude currently at 66° 33′ 44″ (66.5622°) north of the Equator. It is the southern limit of the region of the Earth that experiences the 'midnight sun'.... More. Igarka belongs to the Turukhansk District (Krasnoyarsk Region), and it has 4892 inhabitants (2011). Igarka is situated at the north-western part of the Siberian platform, on the western edge of the Tunguska syneclise, one of the largest sedimentary basins of the world. The terrain is ? glacio-lacustrine plain, about 70 m above the low level of Yenisei River. It is shaped by a variety of permafrost processes, with thermokarstA landform that results when ground ice (ice-rich permafrost) melts. The melting leaves small, marshy hollows and hummocks in the land as the ground settles unevenly. See also thermokarst lake.... More lakes, glacial processes, and pingos. The climateThe average weather we would expect over a long period of time (seasons, years, decades). Climate varies from place-to-place across the Earth. Climate is determined by long-term (over at least... More in Igarka is moderate continental, with low winter temperatures and relatively warm summers. The air temperatures are below zero for about 225 days per year, with an average of 70 rainy and 130 snowy days. The area is dominated by the Yenisei River with a mean annual discharge of about 18 000 m3/s and a peak flow of about 160 000 m3/s. The hydrological network is well developed with typical Western Siberian tundraA type of ecosystem in which tree growth is limited by low temperatures. The origin of the word is from from the Kildin Sami word tūndâr, meaning "uplands" or "treeless mountain tract". In the northern... More rivers (Yenisei River left bank) and Eastern Siberian taigaBoreal forest, a nearly continuous belt of coniferous trees across North America and Eurasia. Taiga is dense forest with many fallen trees and marshy soil. The term derives form the southern Siberian Turkic-Mongol... More rivers (Yenisei River right bank). Due to permafrost degradation, i.e. ground ice thawing, thermokarst lakes are widely distributed. The Northern taiga with relatively dense taiga forests (dominated by larch, fir, birch, and Siberian pine) is the common vegetation type. In the shrub layer, willow and alder are widespread, together with marsh tea and blueberries. Tundra communities dominate the watershed divides, widely represented by peatbogs covered with carex, cloudberries, cotton grass, and bog moss. The hydroclimatic conditions lead to the formation of different permafrost-affected clay soils. Nowadays the laboratory is continuing the research in regional and engineering geocryology. Current projects include long-term monitoring of ground ice from the ArcticDefinitions of the Arctic vary according to environmental, geographical, political, cultural and scientific perspectives. Some scientists define the Arctic as areas having a high latitude, long winters, short, cool summers,... More Circle to Norilsk, a 100.100 m grid of the CALM project (Circumpolar Active LayerThe layer of ground above permafrost that is subject to annual thawing and freezing.... More Monitoring), geothermal measurements in a network of boreholes, studies of permafrost processes, permafrost hydrologyThe study of water in the environment, particularly its amount, movement and quality. It encompasses water in rivers, lakes, glaciers, soil and underground aquifers. The way in which water (liquid and... More, water turbidity, and sediment-fl ux. Methods of construction on high-temperature, ice-rich permafrost and the development of new foundation types are the main engineering research aspects. The Igarka Geocyrology Labaratory is situated in the town of Igarka. Until the early 1990s the Igarka Timber Factory was the key economic activity in the area, but after the prohibition of lumber floating down the river, the factory was closed, thus undermining the city’s economy. Current economy is mainly determined by the river and sea ports, the modern airport, and the service departments of “Vankoroil”, the Vankor Oil Field operator (the oil field is located about 130 km west of Igarka). Igarka can be reached by air and water transport. Igarka Airport has a modern infrastructure and accepts all major aircraft and helicopter types. Flights are performed to Krasnoyarsk three times a week. Water transport connects Igarka with Dudinka and Norilsk (including Alykel Airport) to the north, and Krasnoyarsk to the south, from early June to early October twice a week. Helicopter lease is available.